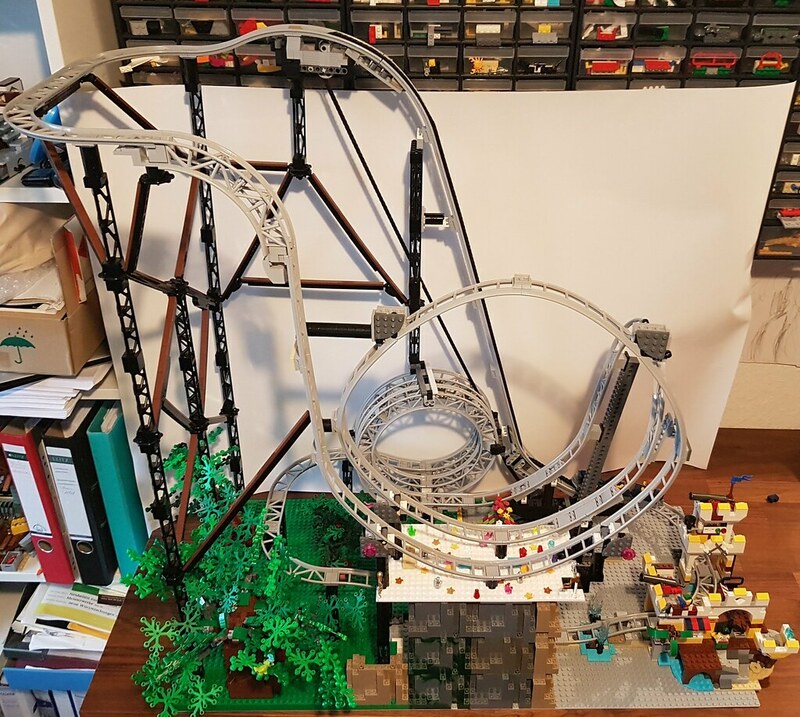 I was working on a roller coaster last year and finished most of the ride. Since I somehow lost interest in it, I decided to show you the progress so far before I dismantle everything. 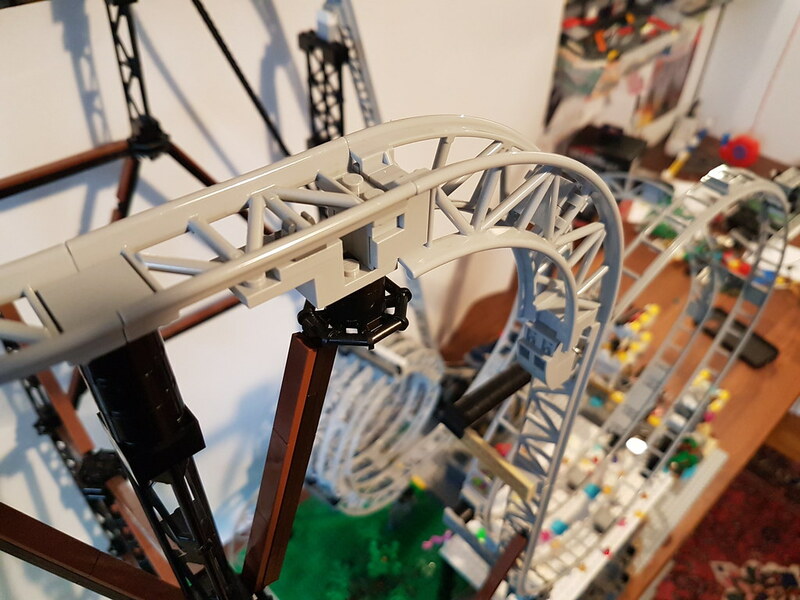 I'd like to point out that I cut some coaster track pieces for this MOC, see here! Poor LEGO pieces, I hope you can enjoy the coaster nevertheless. 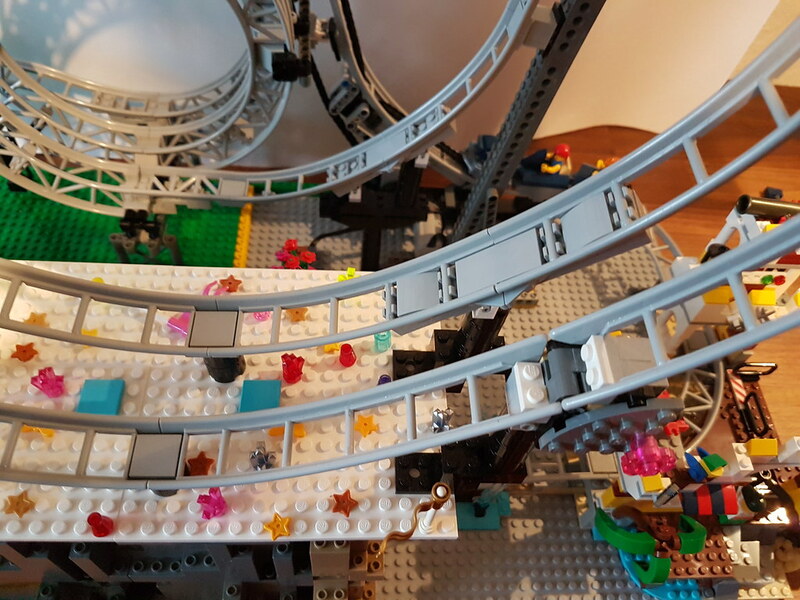 The whole coaster is built on two 48x48 baseplates. The coaster is 76 bricks high. 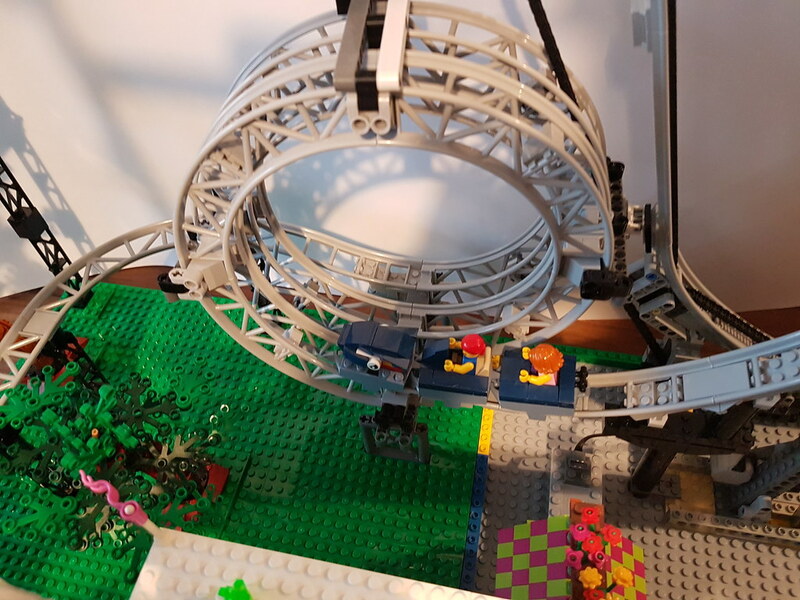 To cramp everything onto two baseplates, I used a very steep ramp using customised pieces. For the dive, I used two curved pieces as proposed by others. For the two smaller loops, I used standard curves, a technique similar to the dive section depicted previously. The chains used for the ramp had to be diverted to work. Still, the chains do not run as smoothly as desirable but most of the time they are doing their job. For the upper part of the ramp, I again used modified parts. Obviously, I did not achieve optimum results but it works. You can find more photos in the flickr album. 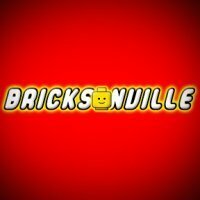 Those must be some serious G‘s on the minifigs! :D Crazy build! Pity you can't embed the video in the post, almost missed it! 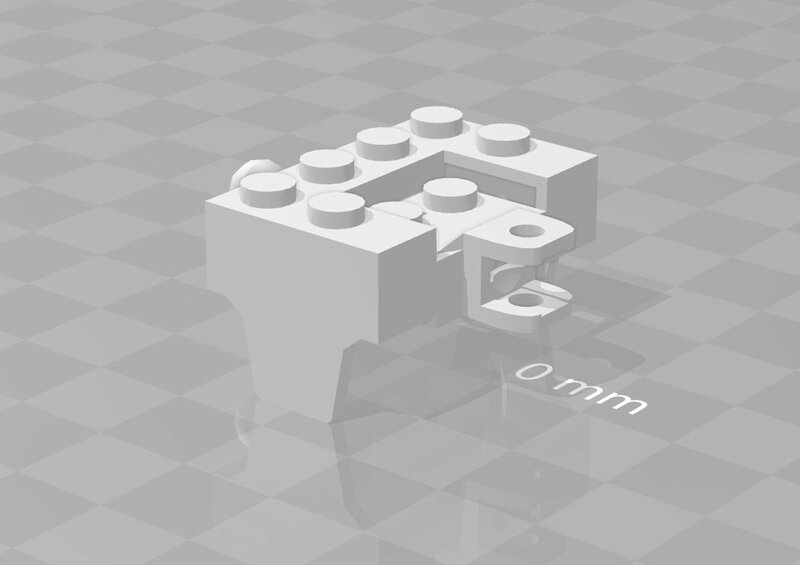 Poor Lego, As for me i start printing tracks and start making bend rails. But meet some difficulties such as 90 degree bend can't handle Lego car because it has 2 axis. So i came to this design Like in real roller coasters ). I printed only 1 car and later will test with 2 cars. I cannot upload picture of track later i will upload if somebody interested. The car looks interesting. I suppose it is not easy to print a smooth surface suitable to take up the axle and wheels, so I wonder if you have any issues with increased friction. Do you also print the axle and wheels or do you use the ones from Lego? 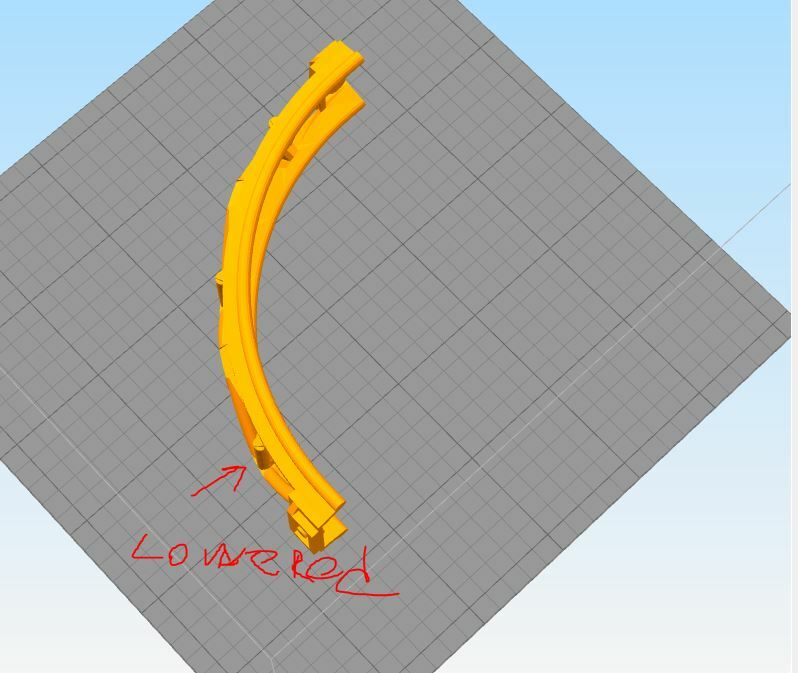 And do you bend straight track or (also) other track pieces? I'd like to see the bent track. Thanks for the interest. I printed the car and wheels. 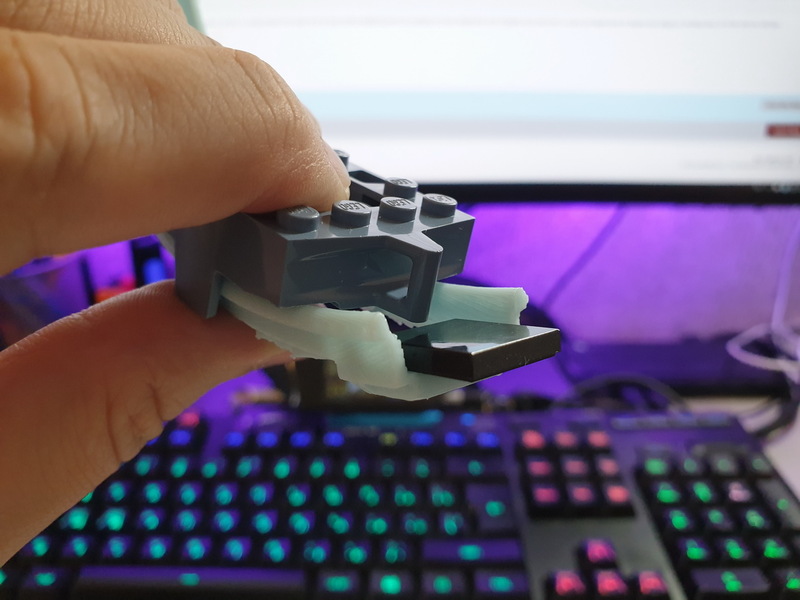 The friction is obviously worse then lego cause I printed track in PLA. And for now, maybe I need to create a less bent track. I Used short straight piece, But I'm thinking bend longer piece it will be more smooth. And I don't know to what degree bend track if I only know which angles could stock lego cars handle. I printed 2 cars the work on short track but I need to reprint track cause they are too layered so the cars stuck sometimes or make less degree. I cannot post more than a 1 picture in the post. 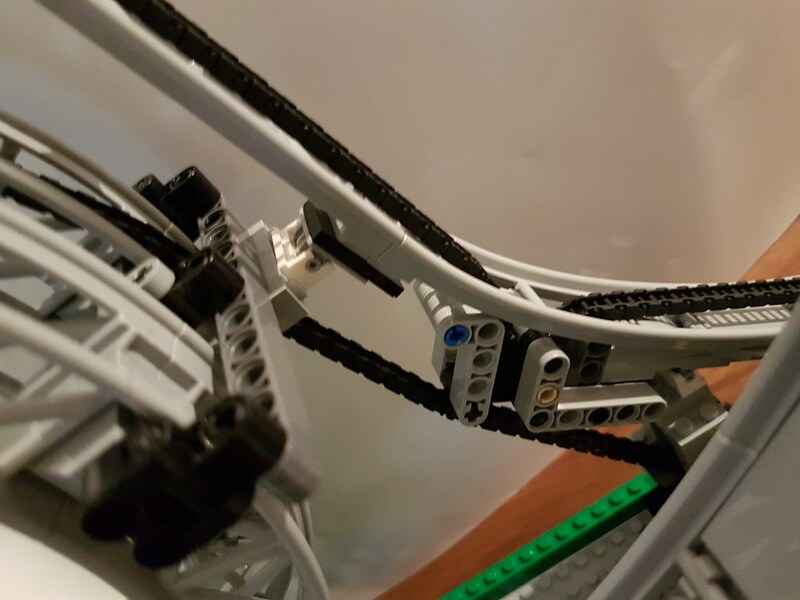 In picture 45 degrees angle it worked fine for stock lego cars. The problem with my cars is connection it works fine but in the connection place between cars they are sag (loose) so it looks not very cool but the conection worked. Shorting the ball i dont think will help cause we will loose up and down degree of moving. Sorry for My English. Thanks for your reply, zagdima. 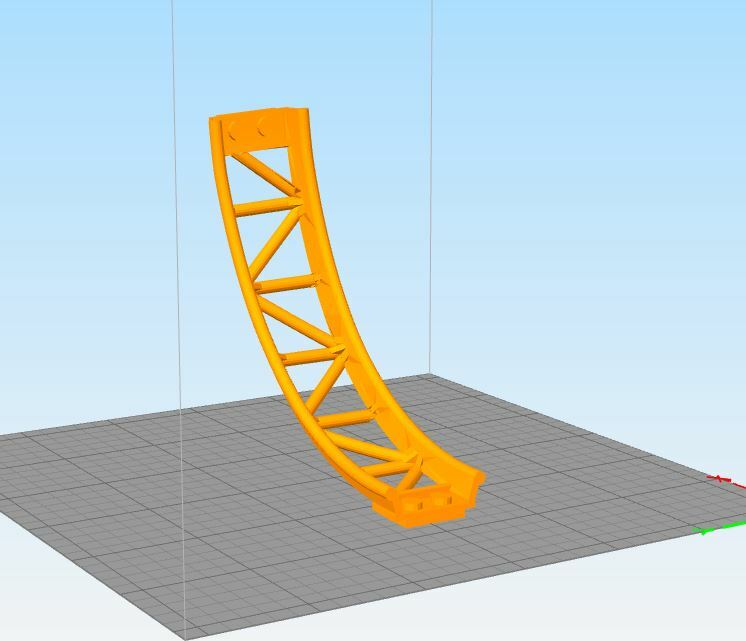 So you are printing the bent track? 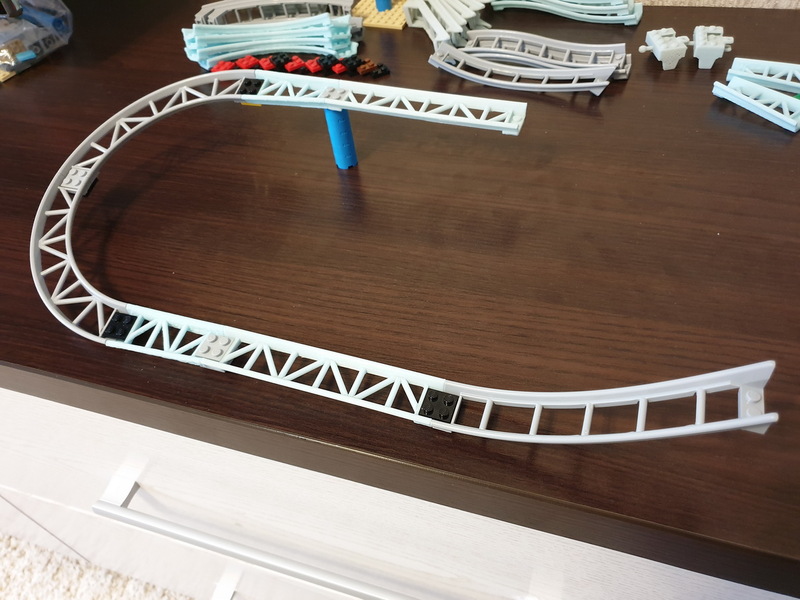 There are also people out there who bend LEGO railway tracks using a heat gun. Those smaller loops are rather genius! I am totally impressed by that!! 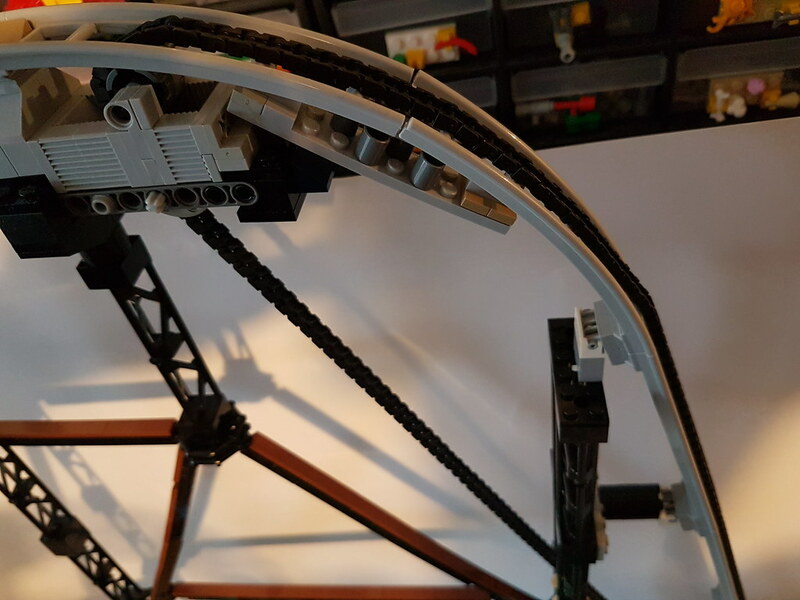 I feel I will now modify my set to include one of those as I feel it is the only thing missing in the roller-coaster set and that achieves it in a nice size too. Clever work. And it works great as well. Impressive! As for me they are expensive, to heatgun them). Nowadays normal 3d printers coast not too much, normally you can get for 170$ + filament around 20$ for 1kg (300m). 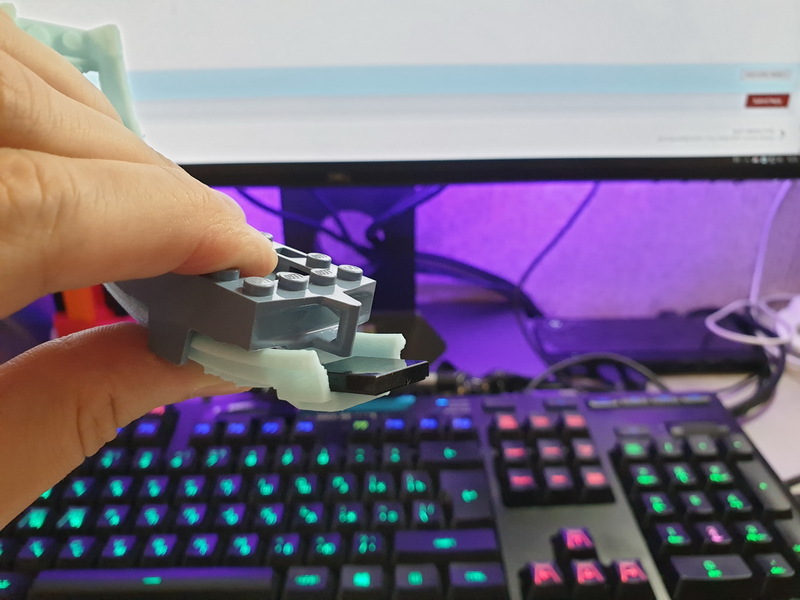 For example quater of a loop needs 3 meter of plastic, the short 45 degree track needs 2meter of plastic and you can count how many pieces you can print with one spool. 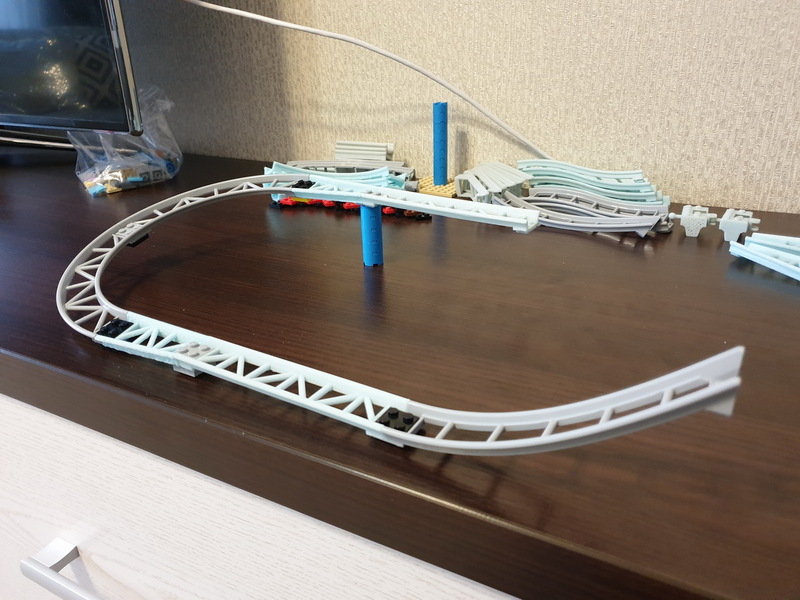 one more picture 1/4 loop but i found that the bars between rails can be a problem for stock car the coupling system can hit bars so i lowered it. 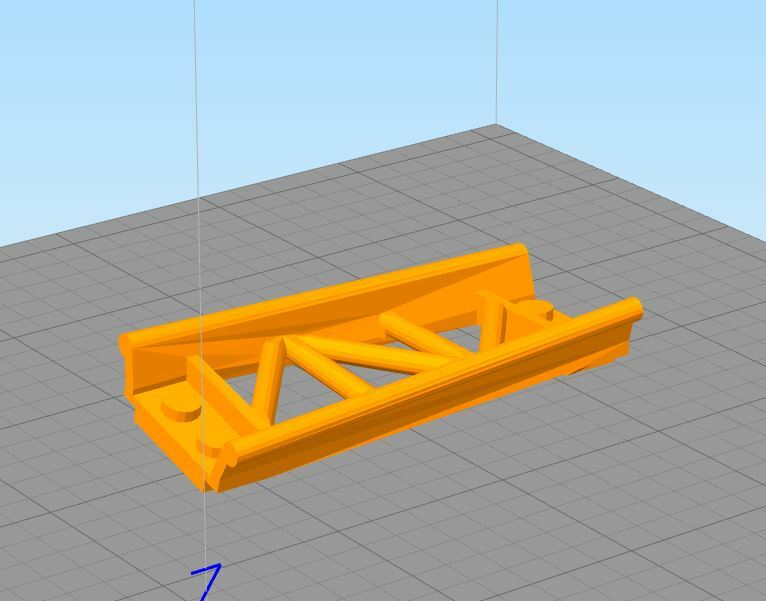 As i mention i now printing 1/4 loop without bar changes. these part designs are very interesting, especially the loops. Thanks for sharing. To be able to put four of the 90-degree pieces in a row, it will be beneficial to insert a small twist into each section. Just enough, so that the beginning and the end of the loop will be parallel. Without that twist, you will need to put some serious stress onto the pieces which is difficult to achieve with clutch power alone. 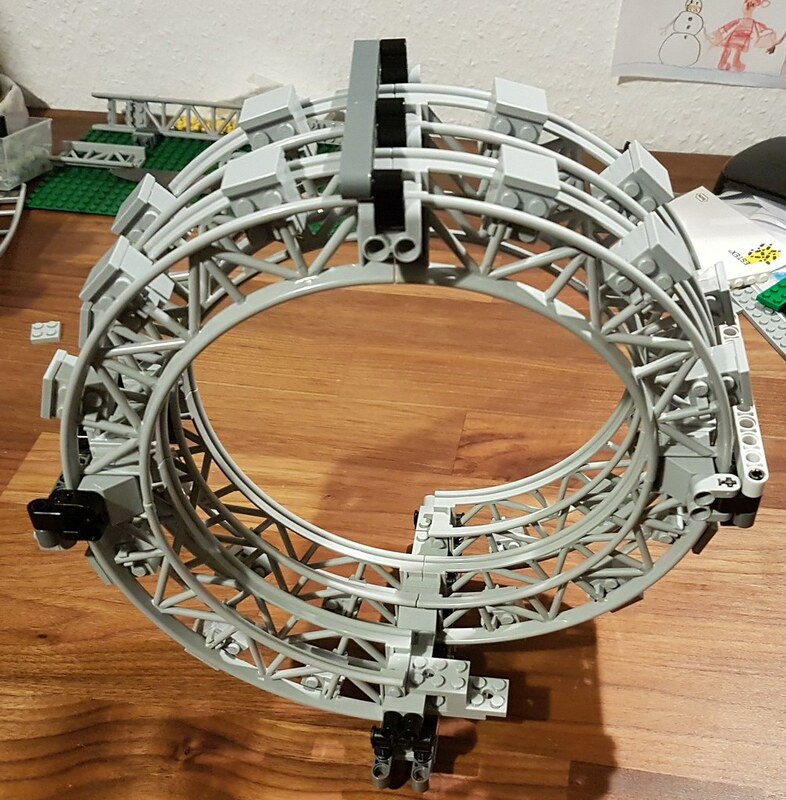 Also, if the standard lego cars cannot handle the 90-degree-pieces, I suggest to increase the radius of the loop. Lowering the bars will probably not be sufficient because most likely you will also need to lower the 1x2 studs at the beginning and the end of each section (which will carry a 2x2 tile!). And it is not clear to me, what exactly you plan to do with the twisted short straight piece (the second pic in your last post). Do you have something special in mind, e.g. to use several of those in a row? The latter would only be of limited use because the cars do not work too well when driving sideways or upside down. About loop i already insert twist. But if we have straigh loop we ccan add short 45 degree curve and the loop will lean to left or to the right. Lowereng bars helped and using just tile is ok check picture. About 90 degree. They cant handle it but 45 degree is ok(45 on picture short piece light blue color on botton after straight and on top after curve.). The reason for this piece you can bend or rotate a part of a track see picture. Maybe this pictures answer some of your questions. The quality of part not so great and mostly on curved ones because its hard to print them. And i sude them mostly as a prototypes if i need i will reprint tjem with better quality. Awesome! Thanks for sharing, zagdima.